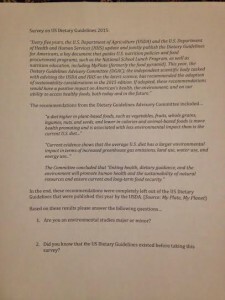 An Environmental Studies Education Minus the Food: What Do Students Studying Environmental Studies Know About The U.S. Dietary Guidelines? Are you an environmental studies major or minor? Did you know that the U.S. Dietary Guidelines existed before taking this survey? Did you know that a sustainability element was potentially going to be included in the guidelines released this year? 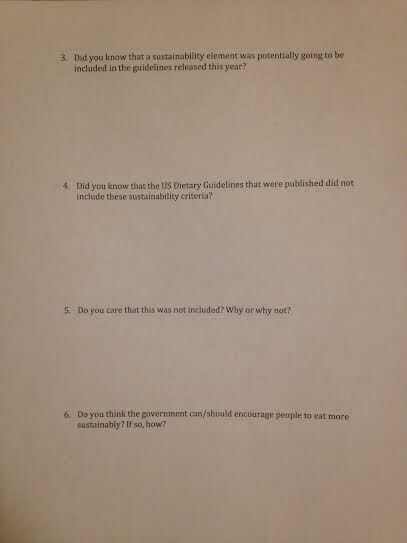 Did you know that the U.S. Dietary Guidelines that were published did not include these sustainability criteria? 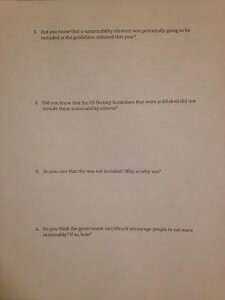 Do you care that this was not included? Why or why not? Do you think the government can/should encourage people to eat more sustainably? If so, how? When reviewing the survey results, I was shocked to find that 18% of the students surveyed were studying environmental studies as a major or minor but only 5% of students knew that new guidelines were published this year. Of this 5%, some were not even environmental studies students. 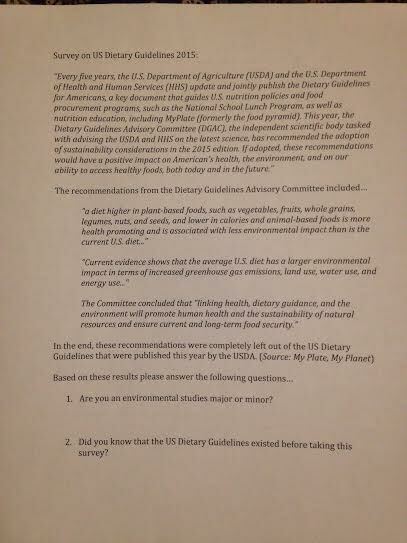 How is it possible that those students who are majoring in environmental studies know so little about the U.S. Dietary Guidelines? 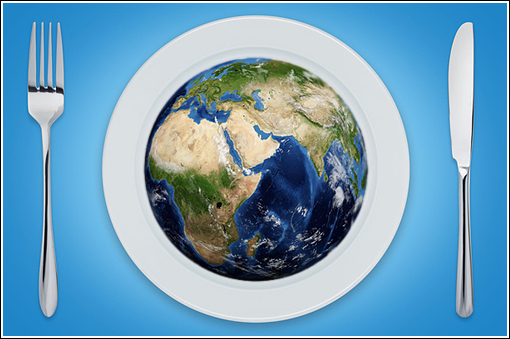 As an environmental studies student, I feel that food is often overlooked and not seen as one of the most important climate change issues. Although I have learned about food in some of my classes, and there are many electives centered around food, it does not seem to be a concern for the majority of students. This became very clear with the results of my survey. I strongly feel that this issue needs to be “brought to the table,” most especially in the classroom of those aspiring environmentalists, because the way we eat does have a significant impact on the environment.